It recently dawned on me that comedy as a genre has gone completely downhill. Oh sure we are inundated with smart, too smart tv series with an army of staff writers producing far too calibrated material, but nothing at the cinema reaches the highs of the last golden age in the 80's. 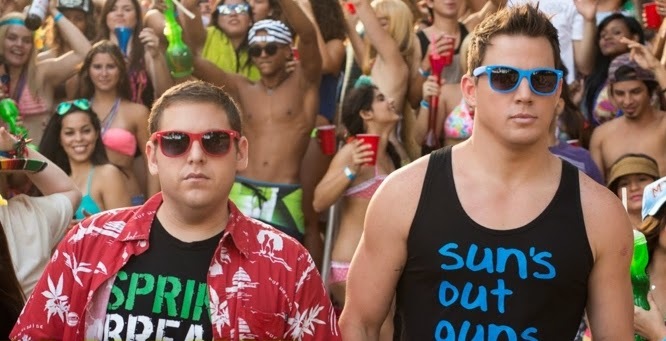 (Airplane, Naked Gun, Working Girl, The Blues Brothers...) Which is what makes 22 Jump Street so refreshing. Yes I hear you say, it is very smart, but for all of its meta flourishes, it never feels smug, and it never forgets to engage with is audience, thanks in no small part to the sizzling bromance between Channing Tatum and Jonah Hill. And it is genuinely funny, not "look at me I'm so clever" funny, I mean laugh out loud, properly hilarious. Such is the fast pace of inventive jokes than one viewing is nowhere near enough to make the most of it. As for the end credits sequence, it ranks high among some of the most dazzling scenes I have seen all year, the film deserves a spot in my top 20 for those alone. Who knew that a slow paced, understated thriller about eco-activists/terrorists could be so gripping and tensed? After the involuntarily hilarious and tragically bad The East which tackled a similar subject last year, Kelly Reichard conjures up a nail-biting film that does not go for easy targets and resolution. The pure weight of modern social and corporate injustice is felt as a depressingly crushing and pervading force, when presented against a motley crue of unfocused individuals whose actions are a mere drop in the ocean that achieve nothing, taking a more sinister turn in some cases. It also features one of best (and rather creepy) performances of Jesse Eisenberg. Wow! What an incredible sensory experience The Strange Colour Of Your Body Tears proved to be when I watched it at the London Film Festival last year, front row, with the sound cranked up at full volume. Giallos fetichists extraodinaire Hélène Cattet and Bruno Forzani had already dazzled us with their previous film Amer, but for their second film that have upped their game, one that is at once more experimental yet slightly more traditional in its narrative. Following the investigation of a man who finds his wife to have vanished in their beautiful art nouveau building, we are exposed to a kaleidoscope of cult film references and stunning visual compositions, each shot deserving to be framed and cherished. How much had we been salivating ever since it had been announced that Jim Jarmush was to direct a vampire films with Tilda Swinton and Tom Hiddleston . And reality proved even greater than our cinephile wet dreams. (oh by the way, anybody who made a cheap swipe at Twilight when reviewing this one, well done you, you're amazing and so original!). Jarmush-esque to the max, Only Lovers Left Alive is a languid and witty rock poem, which makes the most of its unusual yet beautifully filmed twin locations of Detroit and Tangiers in all their nocturnal glory. I am always a little wary of those films which hide their lack of cinematic value behind a "big" subject, especially a historical one. But no such thing with Ida.With it, Pawel Pawlikoski has crafted a delicate and exquite film, and merely uses History as a background for his intimate tale of a novice nun and her world-weary aunt on their quest for their lost relatives' burial ground. Immensely affecting and moving despite (or thanks to?) the sobriety of the direction, Ida is beautiful and affecting and quite simply, a small miracle, which went to become an unexpected arthouse hit the world over.